I delivered a keynote presentation at Tableau’s Customer Conference last week. Several people at the conference expressed appreciation for the insights contained in one of my slides in particular, so I thought I’d share it here in my blog. Contained in these early definitions was the seed of an inspiring vision that caused people like me to imagine a better world, but the business intelligence industry has done little to help us achieve the vision of the people who coined the term. When Thornton May was interviewing people for his book “The New Know”, he asked a prominent venture capitalist known for his 360-degree view of the technology industry what he thought of when he heard the phrase business intelligence. His response was “big software, little analysis.” Sadly, his response rings true. In the 1990s, the data warehousing industry, which had become lackluster due to its many failures and the inability of thought leaders and vendors to tell us anything new and worthwhile, promoted the term business intelligence (BI) as its new rallying cry. It was used as a marketing campaign to rekindle interest in old technologies, but did little to change the course of events. The industry continued to focus on building the infrastructure of data rather than the tools and methods that are needed to actually use data. Until this day the BI industry still focuses on collecting, cleaning, transforming, integrating, storing, and reporting data, but the activities that actually make sense of information and use it to support better decisions have remained behind a wall that they’ve failed to scale and have never seriously tried to scale. For information to be useful, we must explore it, analyze it, communicate it, monitor it, and use it to predict the future, but the BI industry’s attempts to support these activities with few exceptions have been tragically comical. The technology-centric, engineering-oriented perspective and skill set that has allowed the industry to build an information infrastructure is not what’s needed to support data sensemaking. To use the data that we’ve amassed, a human-centric, design-oriented perspective and skill set is needed. All of the traditional BI software vendors and most of the industry’s thought leaders are stuck on the left side of the wall. The software vendors that are providing effective data sensemaking solutions—those that make it possible to work in the realm of analytics on the right side of the wall—have come from outside the traditional BI marketplace. Vendors like Tableau, TIBCO Spotfire, Panopticon, Advisor Solutions, and SAS tend to either be spin-offs of university research or companies that have ventured into the BI marketplace from a long history of work in statistics. Traditional BI software vendors and the scores of recent start-ups that emulate them can choose to climb the wall, but it won’t be easy. They’ll need to rebuild their approach from the ground up. Unfortunately, most of them don’t even realize that their attempts to provide data sensemaking solutions are embarrassingly uninformed and ineffective. Until they see the wall, they’ll never learn to scale it. certainly agree with overall state of the market, data exploration does require an enquiring mind though and this isn’t present in all individuals dealing with data. Partly the responsibility of practitioners to preach an exciting message. Wow – well said. I do like your graphic – simple and effective. Although we are already laser-focused on delivering a new and innovative approach to the BI platform market, your remarks will serve as an additional rallying cry inside of Jaspersoft for human-centricity, great design and truly usable analytics. I’d like to encourage you to focus on attention on the data visualization capabilities of Jaspersoft, which were not very good when I last reviewed them. I agree with your views here but I would add one item to your graphic: Decide. This goes between Analyse and Communicate – I know this is not strictly with the theme of the graphic but it is critical to BI. There are plenty of tools out to the Analyse stage, albeit that those tools are complex and require specialist skills to administer. The issue often is that companies get bogged down fretting about data quality and over-investing in analysis. This leads to them feel that they must have the perfect answer before doing anything. This perfect answer never gets found and so nothing ever gets decided, or done. The focus needs to move to the Decide (and do) element. I’d much rather see companies Decide and opt for “near enough is good enough” then fine tune during implementation. I’ve just read your last 2 posts. I wonder if you could elaborate on your definition of analytics (i.e. what should be supplied by BI vendors that currently don’y exist). I tend to think that the ability of data sense making should still lie more on the people rather than on the software. Interesting that, reading left to right, the slide starts at data collection to move up to the ‘human side’. I suspect this is how most organizations go about the implementation process, rather than deciding what information they want/need and then working down to the process of collecting it. Agreeably, user-centricity is a very important aspect of a BI software nowadays as having a good sense of design and aesthetics lowers both the frustrations experienced by users as well as the learn curve. If ever a product interface can be as polished as Apple or salesforce , while delivering the fundamental enterperise BI structure, it is likely to succeed due to its easy of pick-up and appeal. My hope is that BI tools can be built around an Service Oriented Architecture with lean-client browser based setup, that ultimate offers its capabilities as a self-service models where even novice users can plug and play, abit only accessing a subset of all functionalities. Great post. I like the “sides of the wall” image a lot. Decision makers need BI software that helps them “build to think,” and do it quickly. By build to think, I mean that people should be able to run tests and create prototypes with their data. They need a tool that is flexible and nimble and enables them to ask a business question, build a chart to find the answer, make selections to see associations, and then change the chart or create a new one instantaneously. This is not the realm of traditional BI. Again: thanks for the insightful article. Apart from the vendor capability, I also feel the refusal of BI (IT) stakeholders to accept ‘Change Management’ as an integrated part of Business Intelligence that slows down ‘the scaling of the wall’. Sometimes people want to solve world hunger at the click of a button! By “analytics” I’m simply referring to data sensemaking activities in support of decision making. It is absolutely true that this is primarily a human activity, but it can’t be done effectively without the aid of technology. The human brain, however powerful it might be, needs to be augmented by technology to explore and make sense of data. For example, by visualizing data graphically, technology makes it possible for us to see patterns, trends, and outliers in data that would be difficult and perhaps impossible to see otherwise. Visualizations also allow us to make rich comparisons that could never be made when using tables of numbers. Also, by supporting useful and seamless interactions with data (sorting, filtering, etc. ), technology allows us to stay in the flow of analysis rather than waylaid by the mechanics of using software. People do the work and technology assists–but only if it’s well designed. The order of the items is not meant to suggest the sequence of events. The process must begin with and be grounded in human need. What most software vendors think of as “user-centricity” is little more than a meager nod to the needs of their customers. What’s needed is an approach that is fully committed to and immersed in serving the real needs of people resulting in the development of tools that are designed based on a thorough understanding of people. While most of the items on your list have merit, BI vendors make feature lists like this without really understanding what people need and how to support those needs. Engineers are great at making feature lists and salespeople are great at ringing the praises of particular technologies such as “Service Oriented Architecture (SOA)” and “lean clients”. These are symptoms of the technology-centric approach that hasn’t worked. To support data sensemaking, vendors need to do more than adopt the vocabulary of user-centricity. It is great summary slide to summarize the issues of traditional BI. As a BI service provider more than years with all big BI vendors, I would like to emphasize couple more things to underline human-centric part. While BI is for business people, technology has never come to that point except couple flashy but not efficient functionalities until recently. After 12 years in BI, I would like emphasize the fact human centric approach has been partially or mainly (discussion point) obtained with in-memory approach the first time. We see more and more business people enthusiastically and efficiently in the projects. While entire BI world suffers from lack of resources due to heavy technological BI stack; this is important fact as well as inevitable motivation criteria for service providers like us; rather than, seeing partially unsatisfied customers. What we have been experiencing with the new approach is that people are triggered to question automatically coming up health approach or decision after doing necessary assessment and analyze. Therefore in addition to your words, I would like to add the word of “ triggering” !. Triggering of several actions for the sake of BI projects. thanks again. Can you clarify what you meant when you wrote that the “human centric approach has been partially or mainly (discussion point) obtained with in-memory approach.” Are you referring to “in-memory” data storage in data analysis and presentation tools? If so, how is this more human-centric than other forms of data storage? Once again great insights. I was just working with a customer that did not see past the wall. I did my best to try and explain the problem to them, with little success. You just did it with one slide – thanks. Now I can as well. This is revolutionary Stephen, after all intelligence is a mental activity. BI is not only about insight but also foresight. Forecast/Predict can come after monitor. I’ll make sure I share this with all my BI colleagues. You’re absolutely right. “Predict” ought to be on the list as the last item on the right. Thanks for the suggestion. I’ll update the figure to include it. The slide is worth the price of admission. The challenge (coming from a 20+ year IT veteran) is the right side scares the crap out of IT. Typical IT organizations are looking for control. As a former DBA, giving users “uncontrolled” access to data is scary. However, that’s EXACTLY where we need to go. The people who best understand the data need the freedom for creativity. Reading “Empowered” Josh Bernoff and Ted Schadler of Forrester. That’s what their “HERO”‘s — and the companies they work for — need to compete in the 21st century economy. Another great post. I would put the term “Understand” on the right hand side as well. By that I mean the need to ensure that the message you think you are delivering is the one being received. Or is that encompassed within the term “Communicate”? We often note that potential customers of our visual analytics software are very cautious at first (“We think you’re BI, implying you cannot live up to your promises, and BI is IT-and-not-business so you don’t understand us”), but it’s possible to deal with this legacy of traditional BI, eventually leading to the understanding that other, better approaches exist which allow exploration, analysis, etc. On the other hand, we tend to look at things in a pragmatic way: it should work for the user and for his organization to bring about change in view of real business issues. In developing our interactive software, we recently made what felt like a giant step back – to the left side of your wall – and implemented ‘reporting’, using a simple office connection. This turns out to be a well-appreciated feature, since decision-making in many organizations still takes place in meetings, with reports, and not (yet) by means of interactive tools. I’m not sure where decision-making fits in your sheet since it’s not a data sensemaking skill, but there are at least three ingredients needed for successful use of data: business issues data can help solve, the data itself, and a ‘sensemaking’ process with an outcome that fits in with decision-making. Maybe ‘problems’ should be in the cellar, and ‘decision-making’ in the attic. In-memory DB approach as well as visualization part somehow gives people the ability to envision concretely even if it may not be exactly what they need. Furthermore, competition, deadline as well as TCO pressures are always concerns. I’ve intentionally left out terms like “understand”, which is an outcome. The list includes the activities that we perform to achieve this outcome. The goal of BI is to gain understanding so we can make better decisions. These activities are required to get there. What is it about in-memory DB that gives people the ability to envision concretely? I’m challenging the importance of in-memory data storage because it is a technology, not a function of data sensemaking. If in-memory data storage somehow uniquely supports data sensemaking, then let’s identify what it is that it does. Let’s focus on the true goals, not the technologies that may or may not help us achieve them. I grew up as a designer in the Northeast (of your chart) and recently moved to the Southwest to become a researcher. Before, I was always amazed at how little information made it across the wall. (Or how little I cared about the little that did.) Now that I’m on the other side, I am beginning to understand why. The only way I can think of to describe it is that the end product I’m expected to deliver is not unlike an unopened Erector Set: a bunch of parts neatly arranged and secured inside a precious box. Labeled, bundled, ordered & inventoried, with instructions for just a few of the wonderful things you could build with the parts. On the East side, a little chaos is a good thing, and often leads to breakthrough creativity and deeper insights. Charles Eames knew that, and some of his toys capture that spirit. I’ll keep that in mind as I deliver intelligence – trying not to package it too neatly, and suggesting more than just a few of the wonderful things it can build. Excellent insight. Your experience in the realm of data sensemaking informs your work in data preparation to a rare degree. The BI industry suffers, in part, because relatively few people with experience like yours are involved in setting the course. I liked your description of the “wall that needs to be climbed” by more of the start up BI Vendors. Getting out from under the giant umbrella that is “reporting” is no easy task, but where is the mention of the industry leaders that have actually given End Users the ability to work primarily on the right side of your diagram? Every week I host at least one free webinar that demonstrates the Human Centric capabilities of Business Objects, and the right side of your diagram is a highlight reel for this application. Aside from the “Communication” aspect (not sure if you are referring to passing information on an inter-company level or via Facebook, Twitter etc.) the true value of Business Objects is congruent with your requirements. After reading the comments, I was surprised to see that nobody mentioned the existence of products like Business Objects. It seems to meet the standards you have set forth for a Business Intelligence tool, so why spend time on BI tools that cannot meet our needs? During my keynote presentation at Tableau’s conference, I provided a demonstration of BusinessObjects Explorer to illustrate the fact that traditional BI vendors don’t understand data sensemaking. The product reveals a complete lack of understanding of anything on the right side of the wall. Although there are folks at Business Objects who get it, who have the human-centric, design-oriented perspective that’s needed, they don’t appear to have any influence over the direction of the company as revealed in the products. I am curious to see what your demonstration looked like. I am doing a private demonstration using Explorer tomorrow as one of the features of BOBJ. I have actual company data and I will be showing how the company can search, analyze, and act on historical data that has been collected in various systems. Isn’t that what you are going for on the right side of that wall? When I first started out in application performance management I used to focus solely on creating wonderful visualizations that could present millions of events for exploration by the user in a single pane but over time I realized that even with the best visualizations in the world I was never going to find all the answers without linking back my work on right side of the wall to the left. There were inherent scalabilities in all aspects of the right hand side of my work and tools that could only be addressed if the process was iterative and incremental. I needed to use what was analyzed, learnt and predicted to refine or expand what was instrumented, measured & collected. I needed to connect and balance both sides. It would be great to hear that one or more of your slides touched on this or you have a similar view. There is no denying that the data preparation work on the left side of the wall is necessary and important. Without it, data sensemaking work on the right side of the wall cannot be done. Ideally, data sensemakers should be able to spend all of their time thinking about and presenting data without having to venture into activities on the left side of the wall. It remains true, however, that in most organizations they must cross over to the left side of the wall because some data that they need has not be thoroughly prepared for them. Nevertheless, work on the left side of the wall has been the exclusive focus on the BI industry for many years. The time when the industry’s focus should have shifted to the right side of the wall (not exclusively, but primarily) is in the past, but the needed shift has still largely been ignored or addressed in name only. The BI industry has forgotten that they worked on the left side of the wall to get us to the right side – it was a means to an end, but they’ve become stuck there. I spent the early years of my career working on the left side of the wall, because that’s what was most needed at the time. I shifted my attention to the right side several years ago when circumstances reminded me of the ultimate purpose of business intelligence. Not everyone who works in the BI industry – user and vendor alike – should shift their efforts to the right side of the wall. Work on the left side still needs to be done and still needs to improve. But the balance must now shift to the right. The fruit of our labors (information) is ripe for the picking. Let’s not stand idle while the fruit rots on the vine. Further to visualization and analytics, it is quite simple. Visualization of data gets you to the right hay stack, analytics enable the user to get to the needle. I am going to commit a heresy here and suggest that BI outputs provide a fixed menu of output options with zero ability for user formatting. Three mandatory fields: title, author and date. The degradation of business analysis by diverting time from thinking to decoration has been an unfortunate side effect of standard office software. Great post and interesting comments. Agree that the left side is necessary but not sufficient to have the greatest impact or create the most value. Design will ultimately play a larger role on both sides by enabling more efficient and effective movement from the work involving data to the point of making decisions (with the all-important feedback for continuous learning and improvement). Thanks for sharing! I really like the wall separating these 2 concepts. I am mostly involved on the left side. However, i am leaning into reporting and analytic to help customers obtain and use data to drive their business goals. I find it interesting that there is a wall in the graph at all – and that we expect BI vendors to fix the problem. I believe fluency along the spectrum is more a matter of culture and practice than a vendor requirement. I used to train young graduates to work all along the spectrum and it’s not impossible. You must break down the expectation that “that is a job for IT” (business user) or “I put the data out there – I don’t care what is says” (IT). Putting business and IT practitioners in the same room to work through a problem can be eye-opening for both groups. Business decision makers can learn why things take so long (e.g. transforming large datasets with SQL) or why metadata management is so important. IT can learn how an incorrect join could lead to a catastrophic business decision. If you want to break down the wall, don’t wait for the big BI vendors to rescue you, change the way you work the problem. It is certainly true that we shouldn’t wait for big BI vendors to fix this problem. This expectation is probably the stuff of fantasy. BI vendors do have a responsibility to do what they can to fix the problem, however, because they are largely responsible for creating it. They built the wall. The wall will be torn down. BI vendors can participate in its destruction or they can become buried in the rubble. If BI vendors do not have resources business fluency (and they do not) to apply to make sense of data assets, BI projects will never achieve the desired results. Feeds and speeds, dashboards built with no communications between authors and information consumers result in lipstick on a pig. 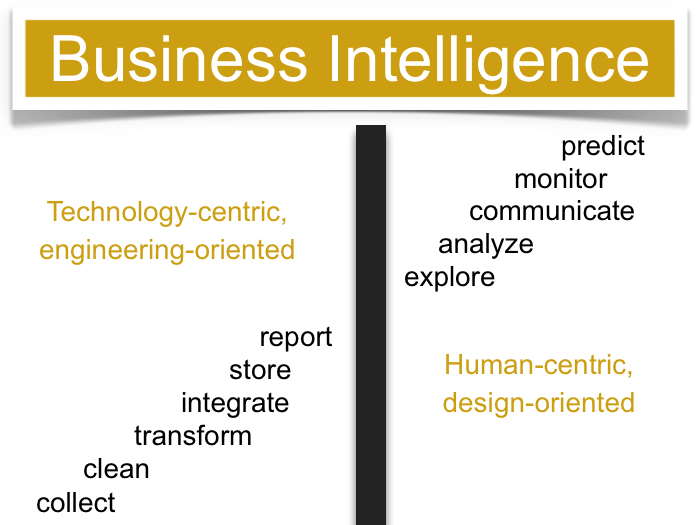 As providers of business intelligence, one of our biggest issues today is the effort we have to put into the left side. For example integrating SAP BW with Business Objects Xcelsius requires so much SAP BW back-end design and build, we lose precsious time in developing the right side for visualization and guided analytics, your right side explore & analyze. We do need our big BI vendors like SAP to do what they can to help fix this type of problem so our efforts are focussed on the right side. I want the balanced tipped so my teams are working more on the right side!….as you rightly stated Stephen, that’s our ultimate purpose. I think the presentation style of the slide is inconsistent with the philosophy of this site. I am surprised by that. The vague over-complicated terms, the awkward stair step layout, the shadow effect on the banner….that slide needs work. I also think the assumption that business information vendors should design software that, as Hans Peter Luhn defined Business Intelligence, should have “the ability to apprehend the interrelationships of presented facts in such a way as to guide action towards a desired goal.” is lazy and dangerous. Mercedes-Benz may be able to develop technology that is ‘human centric’ (applying the brakes before you hit the car in front of you), but non-academic business decisions are rarely so predictable. Information janitorial work (information custodial engineering, if the ego prefers) should focus on properly cleaning, organizing and presenting facts in such a way that BI, as defined by Hans above, can occur. I think it’s the responsibility of people, not computers, to ‘apprehend the interrelationships’ and determine the action steps necessary. I think business information vendors are just creating the tools the information janitors use to do their job, and that is sufficient. While great software and simplified presentation methods with visually appropriate design may be the ‘oxiclean’ of the business information world, the ‘task of apprehending the interrelationships of those presented facts to create action’ is the domain of true business intelligence, and I don’t believe business intelligence can or should be programmed into software. The design of this slide, although not obvious out of context, is very much in line with the philosophy of this site and my work. Bear in mind that this slide appeared in the context of a keynote presentation and was never intended to stand alone without my commentary. The visual effect on the title “Business Intelligence” was there to complement the point that I made when introducing the slide that the term was originally adopted by vendors as a promotional slogan to repackage the work of a lackluster data warehousing industry (in other words as marketing sizzle, thus the flashy visual effect) rather than a genuine call of change. “Awkward stair-step layout”? I sense that you’re stretching a bit awkwardly yourself to find fault. If Hans Peter Luhn intended to say that software should “apprehend the interrelationships of presented facts in such a way to guide action toward a desired goal” independent of human involvement, then I would agree with you that his vision missed the mark. I doubt that this was his intention. It is indeed the “responsibility of people, not computers” to “apprehend the interrelationships,” which is precisely the point that I made in my presentation and that I consistently make in my work. Technology plays a supporting role; humans do the sense-making. Thanks for the explanation about the banner. That makes more sense. Um, I’m not stretching to find fault in the layout. It’s not often that words are assembled from bottom left to top right of a slide, and one label above the words and one below. I just didn’t think it was the type of communication style I would see on this site, that’s all. Anyways….I should try to clarify my use of Hans Peter Luhn’s definition. I thought you were saying that software vendors have failed to scale the wall (and that they should try), not Hans Peter Luhn. I was just using his definition of Business Intelligence, because I think it is the best. It’s no coincidence that IT is on one side of this wall and the business is on the other.